(Nanowerk Spotlight) Given their huge potential, more than 60 nanotechnology research groups worldwide (see: "Proposed standards for triboelectric nanogenerators could facilitate comparisons") have now begun to develop triboelectric nanogenerators (TENGs) for harvesting energy from mechanical vibrations. TENGs convert ambient mechanical energy into electricity for powering wearable electronics, sensor networks, implantable medical devices and other small systems. TENGs utilize charges arising from friction similar to the static we experience on dry winter days; and by nanostructuring the materials in a TENG device, the produced energy could be amplified by increasing the contact area of the surfaces. In a step toward the commercialization of TENG devices, researchers in Korea have presented a novel approach that uses TENG technology to develop battery-free, self-powered electronic toys. 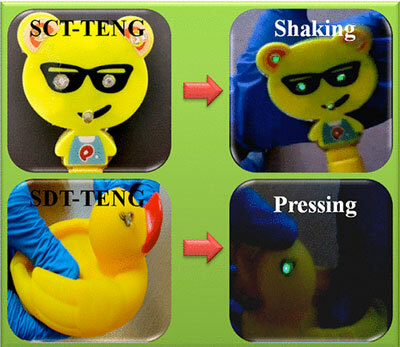 "Our proposed TENG toys – a smart clapping toy (SCT-TENG) and a smart duck toy (SDT-TENG) – are eco-friendly and safe for children," Arunkumar Chandrasekhar, a Postdoctoral Fellow in Prof. Sang-Jae Kim's Nano-Materials & Systems Lab at Jeju National University, South Korea, tells Nanowerk. "They work in contact-separation mode, utilizing triboelectrification and electrostatic induction to harness biomechanical energy. These devices exhibit excellent bio-mechanical energy harvesting performance with long-term stability." Chandrasekhar is first author of a paper in ACS Sustainable Chemistry & Engineering ("Battery-free Electronic Smart Toys: A Step toward the Commercialization of Sustainable Triboelectric Nanogenerators") where the team demonstrate that TENG devices can be successfully used to create smart self-powered toys. "Our work opens up possibilities for the commercialization of TENGs in the consumer market by developing battery-free TENG-powered toys," Chandrasekhar points out. To fabricate the clapping toy, the researchers cut a small piece of PDMS film to fit the clapping toy, and backed it with an aluminum electrode, which acts as a negative triboelectric material. 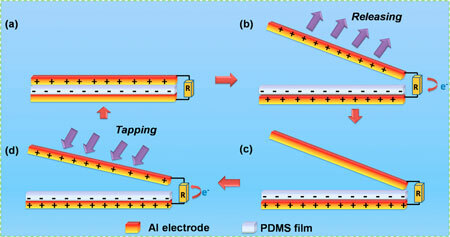 Another aluminum electrode layer, which acts as a positive triboelectric material, was applied on the upper side of the PDMS film. Thin copper wires were used to create an electrical connection. To fabricate the duck toy, the team tailored surface-modified PDMS film to fit the toy. An aluminum electrode layer was attached to the bottom side of the film, with the surface-modified film facing upwards. Another aluminum electrode layer was attached to the topside of the film. Electrical connections were made using a thin copper wire. The electrical output from each toy was connected to a bridge rectifier to obtain a Direct Current signal. Then this output was connected to an LED circuit. Both the devices work on the same principle with different mechanical activation methods (shaking and pressing). The researchers have applied for a patent for these smart toys and are now looking for companies to commercialize this as a consumer product. They note that, apart from the toy sector, TENGS could find widespread applications in disposable biosensors and portable/wearable electronic devices. "Next, we are planning to extend this approach to develop battery-free electronics gadgets, which can be useful to our daily life," says Chandrasekhar. – "We performed a detailed literature survey to find a biocompatible polymer material with dynamic triboelectric properties, and it should be reusable even if the device fell in water or the kids keep take in their mouth. We decided on PDMS polymer as an active layer. This was the first obstacle which we faced during the initial phase of this project. – Packing low-power electronics entirely inside the smart toys played a significant role since it should not be visible for the kids. We fabricated all electronic components inside the duck's body and clapping toy's bottom part. This helped to secure the electronics components. – Finally, to verify the electrical output from the devices, we experimented with a long duration test and found that they can work in different environmental conditions for an extended period." "Our approach transforms a traditional toy into a battery-free interactive smart toy, and it also creates an opportunity to commercialize TENG-based smart gadgets," Chandrasekhar concludes.